In this interview with Colin Seis, we talk about grazing, 'Pasture Cropping', soil carbon and a lot more. Colin has been studying and implementing nontraditional cropping and grazing techniques that have benefited his land in increased soils and carbon sequestration, his livestock with year round grazing and ultimately the farms profit margin with low input production practices. Colin is a very interesting and likeable man that is easy to listen to and learn from. Regardless of the livestock you run, ruminant grazing practices that work in NSW, will work for you too. 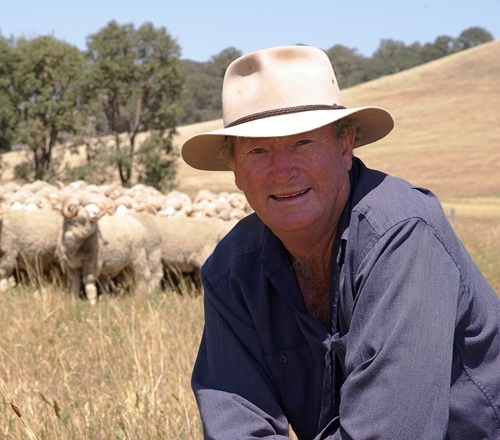 Colin Seis and his son Nicholas own and run the 2000-acre farm “Winona” which is situated north of Gulgong on the central slopes of New South Wales Australia. The Seis family is one of the early pioneering families in the Gulgong district and has been farming and grazing there since the 1860s. Winona runs around four thousand, fine wool merino sheep, which includes a 60 year old Merino Stud and “Pasture crops” around 500 acres annually to oats, wheat and cereal rye. Winona also runs one of the largest ‘kelpie working dog’ studs in the world and sells dogs and pups to many countries in North and South America, Europe and Scandinavia as well as all states of Australia. Colin has a published book on training working dogs (“Working Dogs”), which is sold internationally. He has also conducted dog training clinics internationally in the USA, Norway, Sweden and in most states of Australia. Colin is the pioneer - developer of “Pasture Cropping” which is a method of sowing cereal crops directly into perennial pastures. It combines grazing and cropping into a single land use method where each one benefits the other economically, environmentally and ecologically. Colin Seis and Daryl Cluff pioneered “pasture cropping” in 1993 and since that time, on his farm “Winona”, Colin Seis has spent much of his time perfecting this technique and due to this it is now possible to grow many different types of winter and summer growing crops, without destroying the perennial pasture base. It may appear that ‘Pasture Cropping’ is simply a cropping technique. It is much more than that. ‘Pasture Cropping’ is the combining of cropping and grazing into one land management method where each one benefits the other. The potential for profit and environmental health, including increasing soil carbon are enormous and a lot of farmers in many regions of Australia are showing this to be the case. There are now over 2000 farmers “pasture cropping” cereal crops into summer (C4) and winter (C3) perennial native grass in NSW, South Australia, Victoria Queensland, West Australia and Tasmania as well as other areas around the world. To learn about this and more, to read an article on “Pasture Cropping”, see a short video bio, listen to this month’s training with Mr. Colin Seis.